The Avery Research Center for African American History and Culture is located on the site of the former Avery Normal Institute. 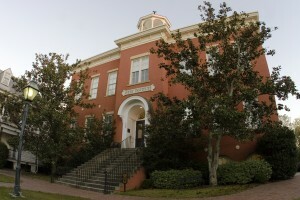 It was a hub for Charleston’s African-American community from 1865–1954 that trained its students for professional careers and leadership roles. In 1985, the alumni of the Avery Normal Institute, spearheaded by the Honorable Lucille Whipper, formed the Avery Institute of Afro-American History and Culture. It joined with the College of Charleston to establish the Avery Research Center to preserve the legacy of the Avery Normal Institute and educate the community on the history and culture of African Americans in Charleston, the South Carolina Lowcountry, and South Carolina at large. The Avery Research Center currently holds nearly 4000 primary- and secondary-source materials that document the history, traditions, legacies, and influence of African Americans and their place in the American narrative. Over 3000 patrons visit the Avery Research Center annually, ranging from scholars and lecturers, to school groups and universities, to families and community members from all over the world. The Avery Research Center provides tours, hosts workshops, presents lectures, and spotlights local and national talents in various forms of creative expression. Additionally, partnerships with the Charleston Public Schools, Berkeley Public Schools, the City of Charleston Office of Cultural Affairs’ MOJA Arts Festival: A Celebration of African-American and Caribbean Arts, and other community groups extend the Avery Research Center’s reach into local communities. RENOVATIONS UPDATE: Unfortunately due to renovation delays, the Avery Research Center will be completely closed to the public until further notice. We thank you so much for your patience!